I’ve been doing this for a few years now, so it always surprises me how many people have never heard of this easy little trick. Doing this removes pesticides and wax from fruit. It also helps your fruit to last longer by killing off any mold that may not yet be noticeable. I put all of my fruit in a big bowl (or sometimes I just stop the kitchen sink, especially if I’m doing apples), then I put about a cup of vinegar in with it. 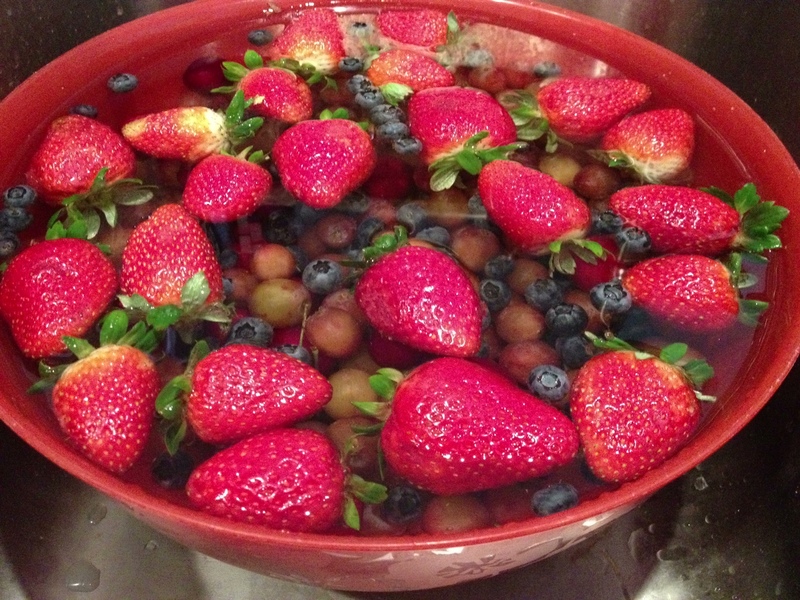 I then fill the bowl with water and let the fruit soak for 15-30 minutes (if you have strawberries, keep it closer to 15… they will start to pickle!) Dump the fruit out in a colander and spray them down with water to rinse them. Let them continue to drain in the sink for a bit. That’s it! You’re done. Your fruit won’t taste like vinegar or anything weird… it’ll just be clean! I love using vinegar for washing. SO easy, natural and cheap!! I’m enjoying your blog too! !